Interesting genre, the nanny literature. A close sister of the governess literature and sometimes a twin of the chick lit. 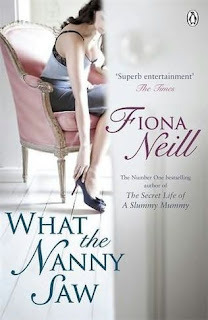 As confessed in an earlier post, I have a thing for books about nannies. Not sure why but it is a topic that interests me so when I saw that Fiona Neill, who has previously made me laugh out loud when I read her book "The Secret Life of a Slummy Mummy", had written a book about a nanny, I had to read it. Ali Sparrow is an English Lit student who is barely making end meets so when she sees an advertisement seeking a nanny for a busy, professional London family, she takes a year off to improve her financial situation. She's quite ambiguous about the whole thing but the money is too much of a temptation so suddenly she finds herself abandoning her life as a poor student to move in at one of the most expensive, posh addresses in London. It is a different world. Bryony and Nick has everything that money can buy except from time for their kids so Ali has to learn how to deal with four kids, a housekeeper and the other nannies in the neighbourhood. Yes, that is about as difficult as it sounds. How would you deal with young twins speaking in their own, private, invented language? Or a teenage girl with bulimia and goth tendencies? Or a teenage boy who sticks to himself and is very difficult to "nanny"? Not easy right? And we haven't even gotten to the adults yet... The controlling grandparents, the picture perfect wife and the banker husband. It takes all her social skills to navigate that cast of more or less eccentric characters is great fun! It's a light read, created for entertainment and sure to make you laugh. As a comedy it works wonderfully. However, it is also an attempt at a commentary on the financial crisis, on greed, on bankers who earn vast sums of money and spend it on champagne but it doesn't work well as a reprimand. Neill should have stuck to what she does best: commentary on the haves and the haves-more-than-you-ever-imagined. Her observations about the ways of the astronomically rich upper class Londoners is hilarious, she does that better than anyone else. Read it if: You subscribe to The Times mainly to read the "Slummy Mummy" column. You don't mind stereotypes as long as they're funny.